In this picture she looks intense and like a real hustler. Betty loved sports. 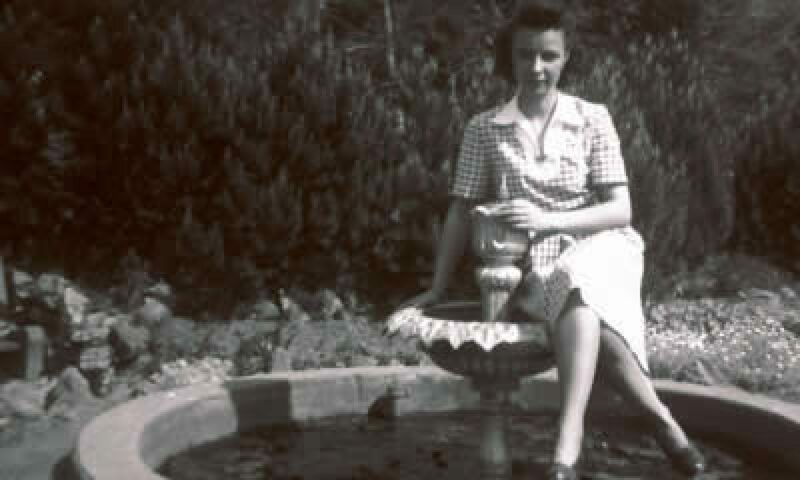 She loved watching her husband to be Mike play football, basketball and baseball high school in the 1930’s. Mike was a 12-letter man and a big, yet gentle and handsome man. She filled us with many fond memories of his exploits. But Betty was not only an observer. She was, from her youngest days, a participant. 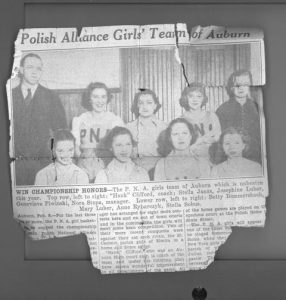 Betty Bommersbach (first on the left in the front row) was a player on the Auburn Polish National Alliance girls’ basketball team in the early 1930’s. She often told stories about her basketball exploits. Often making jokes about her lack of playing time and being short. She often told the story of how she bent over to tie her sneaker when the coach told her to go again to play against a really big team. But you have to wonder what she really did. We would have loved to have seen her play. Even at this young age, you could see she was someone who would give 110% to help the team. The other girls in the picture were her friends throughout her life. This was one of the lessons she taught all of her children. Play for the team, not your self. Give all you can when you have the opportunity. But most of all, enjoy what you are doing while you are doing it, the chance to play may never come again. 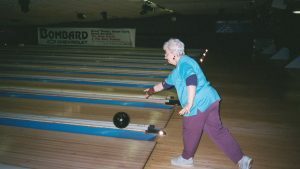 Betty was also an accomplished bowler. Though she never won tournaments that we know of, she was a friendly competitor. In her middle years, she deferred to our father to be the bowler in the family. He world bowl in the Thursday night league at the Polish home while she stayed home watching the kids, cooking and waiting for our return. These two pictures are from 2002.On the left she is letting one fly. Great loft, great follow through. She was a natural. 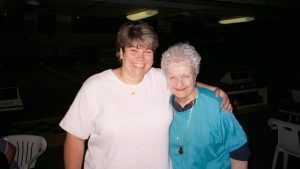 On the right she is talking with Michele Feldman, one of the best bowlers on the Women’s Professional Bowling tour. Betty gave Michele a signed a picture with her autograph and later received one from Michelle in return. She was always proud of these mementos.